I was looking to get a new phone for a while and wasn’t sure what to get. 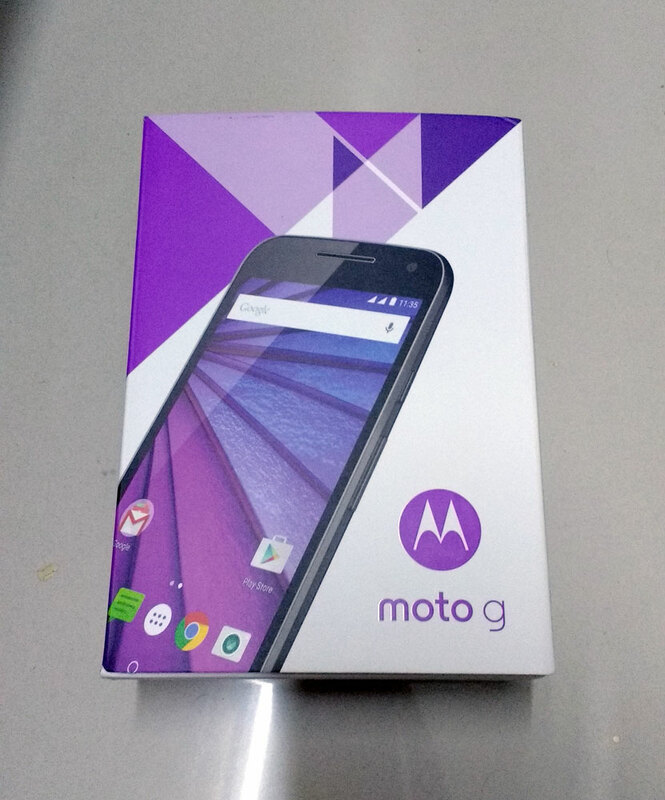 I heard rumors about the Moto G 3rd gen (Moto G3), and decided to wait. The wait was worth it. 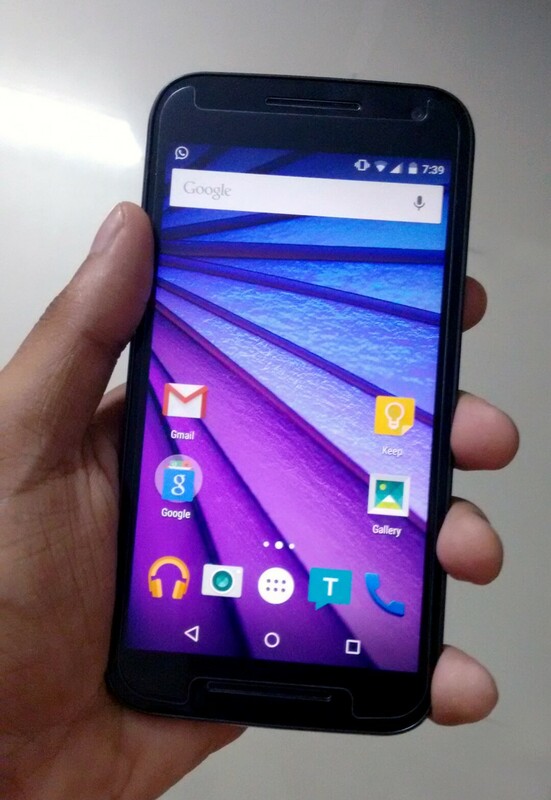 I bought the Moto G 3rd Gen 16GB internal, 2GB RAM variant, in black. I’d suggest you go for the same too as there’s not much you could do with the 8GB variant given there’s only about 3.2GB free space remaining for you to play around with. One can say Motorola has played it safe with the build here. Last year’s model was pretty solid, and they’ve improved upon that. The front speaker grille are less obtrusive and suit the phone’s design well. The back design is what I love. It sports a diagonally ribbed texture, along with a centered camera and two-tone flash, housed in a metallic strip. I particularly like this texture, including the power button. 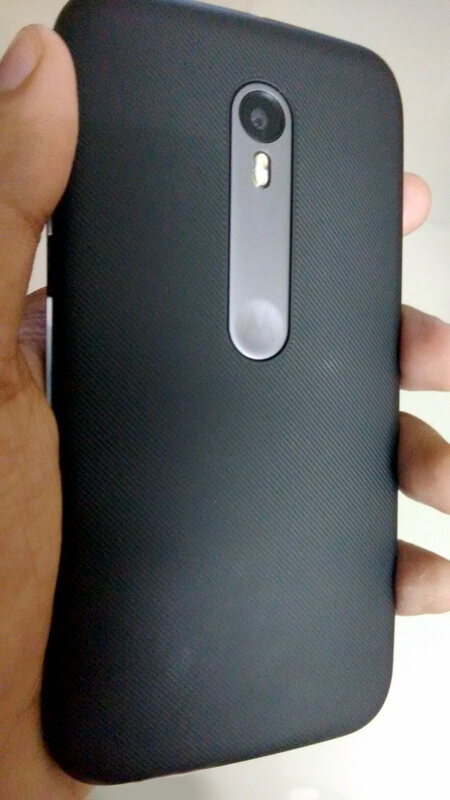 The strip accents the back very well, along with Motorola’s logo. The overall back texture is a welcome addition, making me more confident while holding the phone. Motorola even made the Moto G water resistant with a IPX7 rating. On paper it says the phone can withstand upto 1 feet for 30 minutes. However, its not designed to be used while underwater. The important thing to note here is, only original Motorola back cases will help with water resistance, provided the back is sealed properly. Not to worry as when you power on the phone first time, it will walk you through all this. Overall the phone doesn’t look cheap in any way. The build is solid and the phone feels firm to hold. I don’t ask for much in terms of display here. 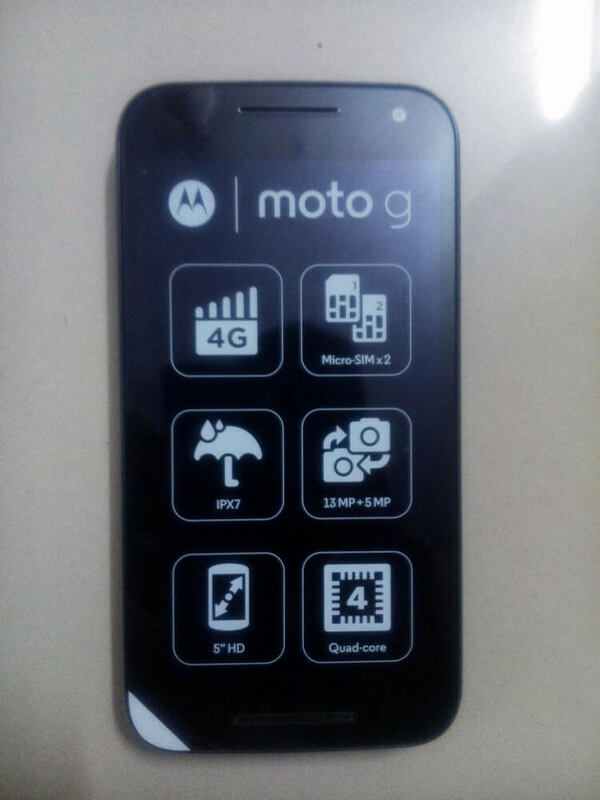 Motorola stuck with the Moto G2’s display, going at 5-inch HD (720x1280p) display (entire specs here). I’m satisfied with this. The display is good, though not too sharp as full-HD displays. Nothing to complain here. In fact this would only do good for the battery. 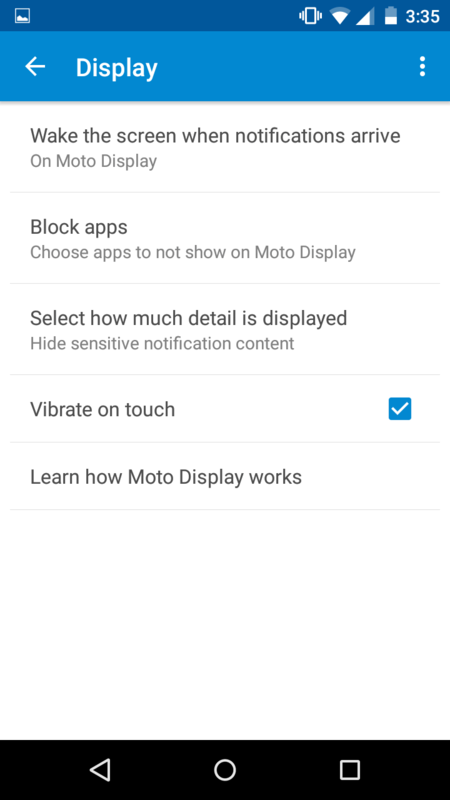 Motorola’s added an on screen display (notification) feature, which in my opinion is pretty neat. You can view all your notifications, and control your music without having to unlock your phone, each and every time. Neat! Touch response is excellent. I carry out my daily tasks such as email, texting, social media, light gaming with my Wi-Fi on the whole time. No hiccups or lag whatsoever. Naturally you might want to replace that ASAP. No bloatware. Stock Android. Moto apps. That said it all. I’m happy to see my homescreen free of useless apps. 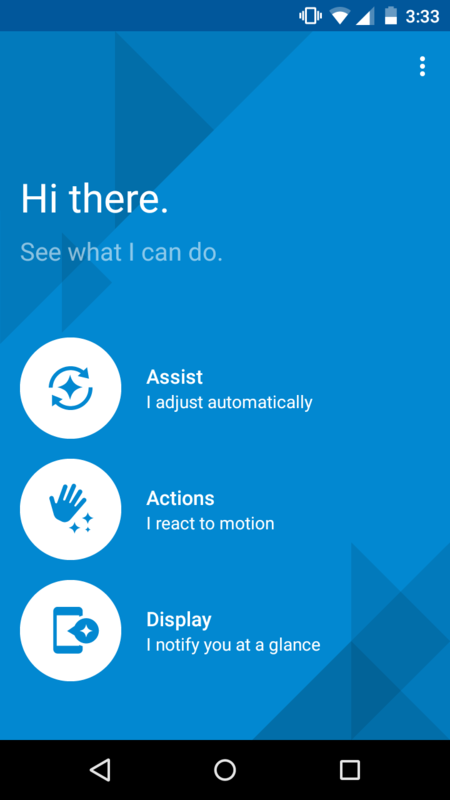 Motorola’s set of installed apps improve upon the already brilliant user experience. helps tailor your phones audio settings depending on what you’re doing or where you are. 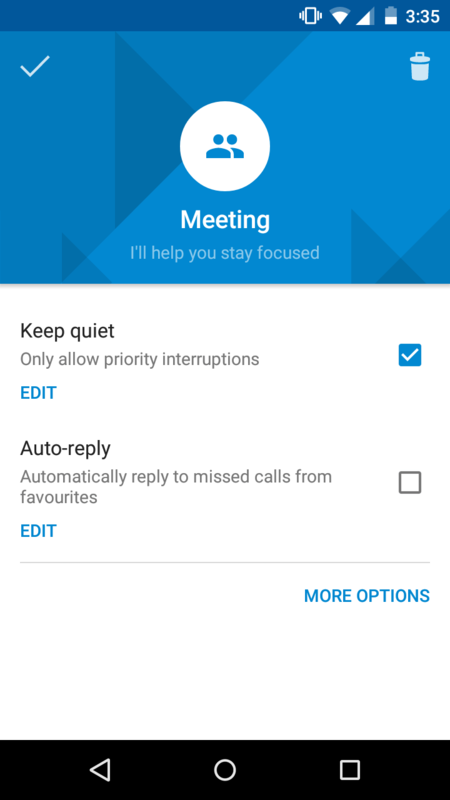 For instance if you’re in a meeting, it can silent all calls. If you wish your favourite contacts can still get to you on the second ring. 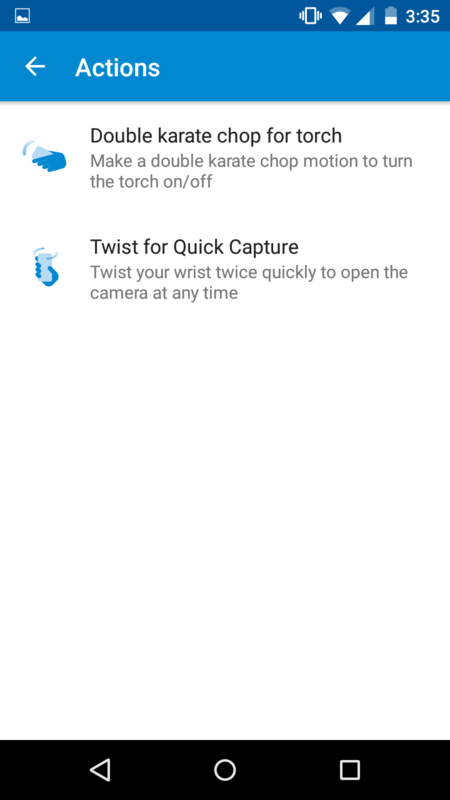 Two neat gestures, a double karate chop for torch and twist twice to open the Camera. You can even twist twice, to switch back and forth between the front and rear camera. The good news is these gestures work as said, quite well. The screen wakes to display notifications, that you can view without unlocking your phone. You can tailor this by picking which apps you don’t need a notification and so on. 13MP rear, 5MP front camera. Fast shutter. Need I say more? Motorola has steadily been working on the camera. The G had 5MP, G2 had 8MP and G3 has 13. Motorola says the G3 uses the same camera module used in Nexus 6. While that sounds good on paper, that’s not the case really. Images snapped under well-lit conditions (daylight) are brilliant, while low light images are decent, they tend to suffer from noise. Especially if you prefer taking a snap without flash, like me. However, the two-tone flash built in is good. The shutter is very fast even if you turn on HDR, that’s great news, complemented with a top-notch and clean camera UI, that makes taking photos with the Moto G3 a breeze. Here are some random shots I’ve taken (under various conditions) for you to judge. Moto G3 packs a 2470 mAh battery. Personally I felt this was low, but I was wrong. The phone lasts remarkably well. I use this throughout the day with Wi-Fi on the entire time, browsing, emails, various social media, gaming and taking lots of photos. End of the day I have about 30% left. Oh, and did I mention I charged it the previous night? To me, that’s good enough. What I learn from all this is that “Hardware specs aren’t everything in a phone“. The phone is snappy, performs great. No signs of lag whatsoever. Good camera (fast shutter). Water resistance is a welcome addition. 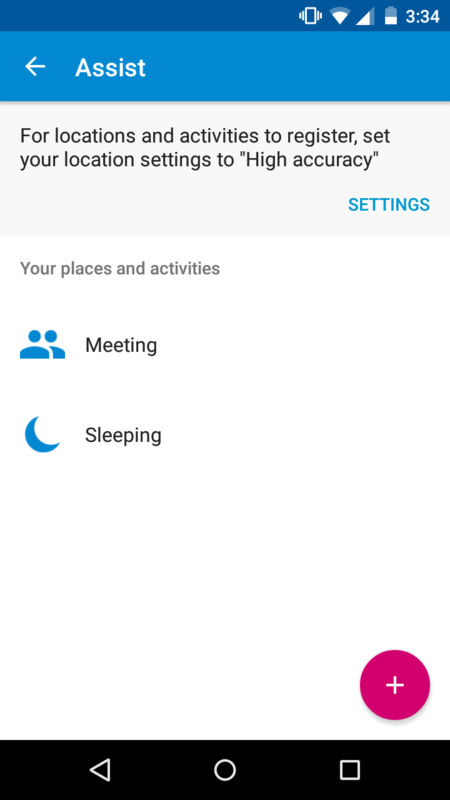 Butter smooth, bloat-free Android Lollipop. Need I say more? For India, you can buy Moto G (3rd Gen) from Flipkart. They did a damn good job of delivering it. Or purchase one from Amazon. 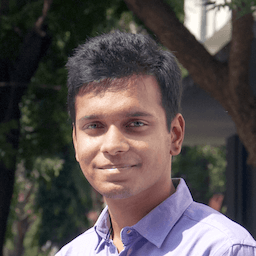 [/su_column][su_column size=”2/3″]If you’re looking for a budget phone, look no further. The Moto G 3rd Gen is an all round performer. Whatever it does, it does well. Motorola shows others, this is how you make a budget phone! It does it in style and shows what’s possible at this price range. When Motorola launched this phone, their slogan was “Choose the phone that’s always there for you“, and I’d support that. Even the cons mentioned above is no deal-breaker, that’s just me nitpicking.